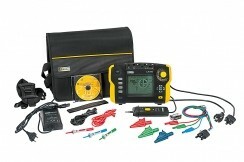 The C.A 6113 is an ALL-IN-ONE instrument for testing electrical installations in compliance with the national and international standards (IEC 60364-6, NF C 15-100, VDE 100, XP C 16-600, etc). It combines design, ergonomics, simplicity, performance, rapidity and accuracy. Suitable for all neutral systems (TT, TN, IT), it is ideal for all sectors: industry, tertiary and residential. 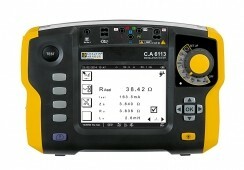 The rugged, compact C.A 6113 is specially designed for quick and effective familiarization. On its large backlit B&W graphical screen, users can view all the crucial results at a glance. A rotary switch on the front of the instrument gives direct access to all the functions. A large number of audio and visual symbols are available for quick interpretation of of the results according to the standards. The contextual help for each function guides the user step-by-step or only when required. The high-performance C.A 6116 offers excellent measurement stability, even in disturbed industrial environments. Delivered in a bag with a large number of accessories, a wrist strap and a 4-point harness are also available as standard features for "hands-free" use.